What do you mean, Frank could drive when he was 12?! Frank’s family had the famous Nash. The Nash was very stylish-green body with black running boards. Every few years it was updated with the latest innovations in safety and comfort. It is said that the Nash had the best heating and ventilation system available anywhere for over twenty years. Not sure if Frank cared about the heating system. He preferred taking the neighborhood kids on a joy rides-windows down! Mama and Aunt LaLa drove that Nash to Denver and back. Franklin took the wheel when they went see to cousins in La Junta. Frank had the “go ahead” from the local judge and police. He could drive whenever he wanted, after all, they knew Frank was much better at driving than Ol’ Man Loper. Frank at the wheel and he was only 12. Now you might wonder, “What about a license?” Ask Frank, he will be fast to let you know, “It didn’t matter, no one had a license. Why would I need one?” Just like the rest of the population, it wasn’t until after World War II Frank received a drivers’ license. 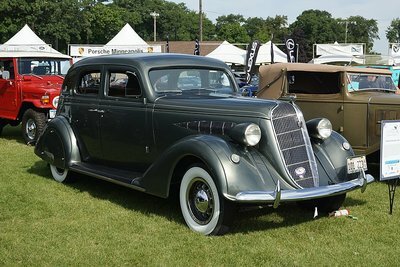 Photo Credit: Wikimedia Commons – unfortunately Frank doesn’t have a picture of his old family car, but it may have looked something like this one.